It is the season of Monet and Manet─and big money at Sothbey's and Christie's, the world's most prestigious auction houses. Monet's legendary impressionist work, A Parisian Street Scene, fetched a record £7.7 million last fortnight. but despite the record prices, the auction world is abuzz with another historic work up for sale next week─hitherto unpublished letters by Mahatma Gandhi estimated to be by far the most important archives of the father of the Indian nation. There are over 260 letters written by Gandhi to his close friend and disciple, the Polish-German Jewish architect Hermann Kallenbach, 15 letters and notes written by the Mahatma to his follower Hanna Lazar, and over 130 telegrams sent to him by well-wishers before he left South Africa. Dr. Peter Beal of Sotheby's books and manuscripts department describes the letters as being "of exceptional significance not only because of their huge volume but also since they shed considerable light on al little known period in Gandhi's life─his years in South Africa: and because the letters were spread over 15 years, one can see the gradual formulation of Gandhi's most powerful concepts, the philosophy of ahimsa, satyagraha. The letters, all in English, are addressed variously to ‘Mr. Kallenbach’, ‘old friend’, ‘Copper House’, and are signed ‘M.K. Gandhi’, ‘Lower House’, ‘your old friend’, or simply ‘Bapu’. Most of them are written in ink or pencil: a few are typed or in the hand of an amanuensis. The letters run into more than 1,200 pages, many of them on official paper, notably Pretoria Goal. They are written on board ships and trains, from various locations in South Africa, London, Heidelberg and India. The first letter in this collection is dated February 9, 1909, and the last December 5, 1944. Though Sotheby’s are tight-lipped about the identity of the collection’s owners it is reliably learnt that the letters belong to the Kallenbach family. Sotheby’s has put a price tag of £70,000 to £80,000 on the collection, but expects it to reach six figures. As auction day at Sotheby’s―December 18―approaches, inquiries made at the Indian High Commission regarding the Indian Government’s plans to acquire the letters elicited the response that the matter was being “considered”. Foreign scholars feel that if the letters go back to India, it would be a coup of sorts, a superb addition to the Gandhi Museum and a windfall to Gandhi scholars. At present the Indian Government has compiled Gandhi’s writings in 85 volumes running into over half a million printed pages. The task begun in 1957 is still incomplete, a major gap being Gandhi’s reflections on the years in South Africa. The letters otherwise chronicle Gandhi’s reactions to many of the major personalities, aspects and events of his life and bear vivid witness to the development of his philosophy. In a remarkable early letter written from Pretoria Goal in 1909, Gandhi wrote consoling Kallenbach who had lost his mother: “Why need we grieve? Our affection is surely not restricted to their bodies which were bound to be reduced to their natural elements some day.” Gandhi mourns with similar stoicism the death of his brother in 1914: “It is no calamity that my brother is dead, if I am ready to meet death and consider it as the supreme and welcome crisis in life…..” Much light is shed on his sometimes turbulent relations with other members of his family, including his sons Harilal (“more and more going from me”) and Manilal (“a very weak boy”). Gandhi often discussed with Kallenbach his hopes and plans for his political fight against apartheid in South Africa. In one such correspondence, referring to Jan Smuts, he wrote: “Smuts sent a message that he wanted to see me…..We had a very sweet chat…..We talked mostly about the two civilizations―ancient and modern―not eastern and western. 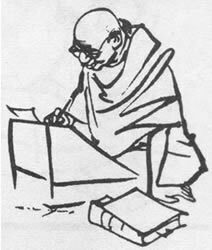 I think that he was sincere in what he said.” Concluding that the policy of petitioning was an emasculated one, Gandhi stated that it was “a measure of our weakness……As that the only unfailing remedy is to be sought in unadulterated passive resistance: that is the suffering of the people”. This was the genesis of the concept of satyagraha, which a decade later Gandhi launched against the British with such shattering results.